FLEET OPTIMIZATION aEdge is because of its fl exibility, saying they are fi nding it rela- tively easy to use even with older systems and ships, in part be- cause the OstiaEdge platform does not require replacement of current systems, but rather integrates existing data into its system. 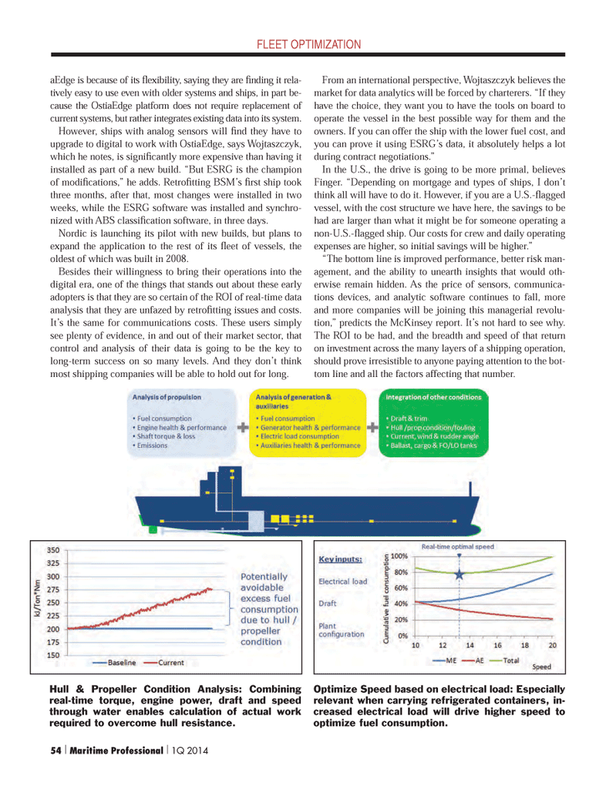 However, ships with analog sensors will fi nd they have to upgrade to digital to work with OstiaEdge, says Wojtaszczyk, which he notes, is signifi cantly more expensive than having it installed as part of a new build. “But ESRG is the champion of modifi cations,” he adds. Retrofi tting BSM’s fi rst ship took three months, after that, most changes were installed in two weeks, while the ESRG software was installed and synchro- nized with ABS classifi cation software, in three days. Nordic is launching its pilot with new builds, but plans to expand the application to the rest of its fl eet of vessels, the oldest of which was built in 2008. Besides their willingness to bring their operations into the digital era, one of the things that stands out about these early adopters is that they are so certain of the ROI of real-time data analysis that they are unfazed by retrofi tting issues and costs. It’s the same for communications costs. These users simply see plenty of evidence, in and out of their market sector, that control and analysis of their data is going to be the key to long-term success on so many levels. And they don’t think most shipping companies will be able to hold out for long. Finger. “Depending on mortgage and types of ships, I don’t think all will have to do it. However, if you are a U.S.-fl agged vessel, with the cost structure we have here, the savings to be had are larger than what it might be for someone operating a non-U.S.-fl agged ship. Our costs for crew and daily operating expenses are higher, so initial savings will be higher.” “The bottom line is improved performance, better risk man- agement, and the ability to unearth insights that would oth- erwise remain hidden. As the price of sensors, communica- tions devices, and analytic software continues to fall, more and more companies will be joining this managerial revolu- tion,” predicts the McKinsey report. It’s not hard to see why. The ROI to be had, and the breadth and speed of that return on investment across the many layers of a shipping operation, should prove irresistible to anyone paying attention to the bot- tom line and all the factors affecting that number. Hull & Propeller Condition Analysis: Combining real-time torque, engine power, draft and speed through water enables calculation of actual work required to overcome hull resistance.